Prologue: Last month we divvied up tasks based on some Agile concept; I believe we’re “writhing” through the next “suffering revolution” on the “Wheel of Pain”, if I have the terminology correct. I proposed that we shove Mineshafts off the current month’s TODO because I didn’t think they were as important as other features. Naturally the task of implementing Mineshafts ended up being assigned to me, as is only correct according to the Iron Laws of Bureaucracy. Subsurface mining is pretty straightforward because we abstract the details: the player builds a “Mine” building with a “Mineshaft” module (and at least one door! we’ve had problems with people not putting doors on things!). 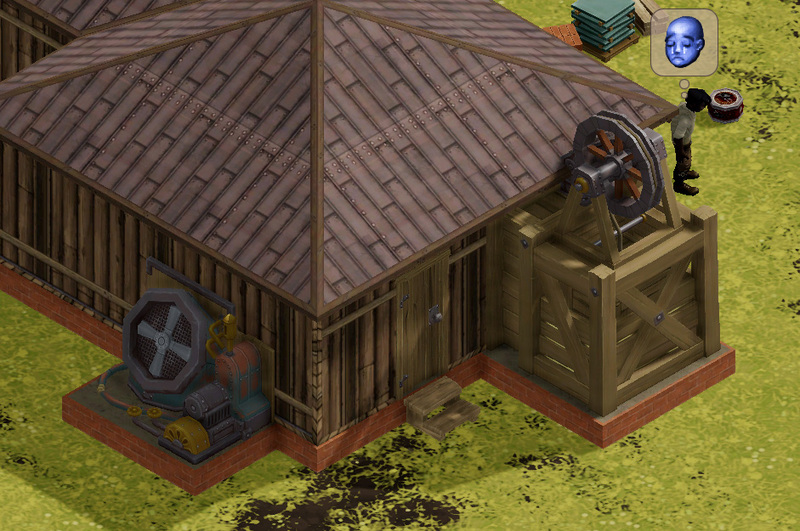 Once these are built, the player assigns a work crew to the Mine. Using the recent code done for Chapels and Laboratories, the labourers in the mining work crew are transformed into properly-outfitted miners wearing the correct uniform and everything – it’s great to finally get these occupation-specific models into the game properly! That done, a Mine creates its own job order to start mining and pretty much runs itself automatically so long as you have a workcrew assigned – at least for this first implementation; we’ll get into additional complexity later. Allow mine upgrade modules (of which we have a handful to draw on) to make mining more efficient, to offset slowdown over time. Digging too greedily and too deep, of course. Now: having a (weakly) infinite source of mined resources begs some questions and the answers lie in the other feature I was assigned from the Wheel of Pain: module maintenance! No, really, this is cool! We don’t want to make this a choiceless choice. There should be an ongoing cost in resources and labour to maintain a high-efficiency, “teched-up” colony, with high-level machinery festooned with shimmering cogs and so forth. How it works: After a workshop module is used some number of times (which can be easily balanced via data files) without being carefully maintained, it’ll need repairs. Or a module is damaged by some outside sources like Fishpeople, Bandits, or Explosions (thus tying modules to the ‘object damage’ system we’ve had for a while but only applied to a limited set of game objects, including commodities, crops, and gabions). Thus damaged, the module will create a “Repair Module” job that pulls as a requirement one (or more) random resources from those used to construct the module. That’s your repair cost, and someone should get around to doing it sooner or later or the damage state of the module will advance until it is destroyed. Then, after some argument, I conceded to Daniel that I guess we shouldn’t make this system just cause Carpentry Workbenches to explode at people as if this was some kind of apocalyptic industrial accident-wasteland where only the diligent survive. We could provide a benefit to staying on top of repairs: if routine maintenance tasks are performed with appropriate regularity, then machines could operate faster and more efficiently, maybe we can even avoid material costs for repairs, though this is all subject to the demands of economic balance. … And yes, this means we should shove perennial agriculture and forestry back onto the Wheel of Pain in support for the above points. All in good time, dear colonists, all in good time! 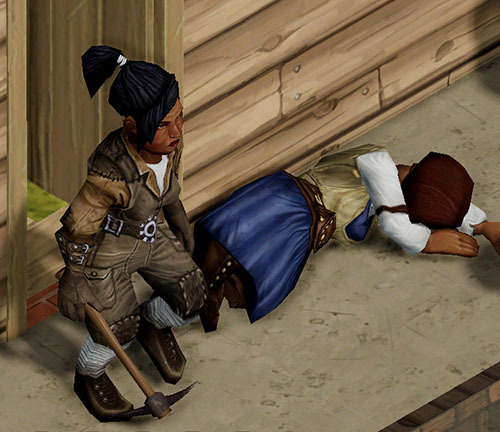 Internally we’ve been discussing the gameplay arc of a game of Clockwork Empires, of what distinguishes the beginning of the game from the midgame. In rough terms, the beginning of the game ought to be about sheer survival while the midgame is about opening things up a bit, giving the player more resources and more choices of where to apply those resources. These low-micromanagement/self-sustaining resource supplies are what lets a player stop worrying about, for example, finding some berries or malachite nodes over the next hill — we want players to worry about other things like special events, specialized construction projects, how to deal with factional conflict, and so on. And to get there, you’re going to need a whole lot of bricks! And where did trees come from? So, as source of infinity tree-lumber, I propose the Infinity Accelerator that creates new worlds that can be lumberjacked. It required several corpses to be sacrificed for the necessary energy, but the rewards are great! Otherwise, you could make people-lumber. Just chop one of those British stand-still guards and cut them into people-planks and your Eldritch village has never been so popular! I was interested in the points raised in the section “What’s Really Going On”. I’ve managed to get to a state where I can routinely set up a colony that addresses the immediate needs (or so I believe) that generally comprises kitchen, carpentry workshop, lower class house for sleeping, couple of farms – I feel like the folk are out of the immediate danger, and that things are on an even keel for the ‘opening up’ to getting some mining and smelting going, but I’m still thinking in terms of immediate needs. The relative scarcity of wood is an issue – but is it a problem in game design or a key point of the game itself – isnt that what the game is about? I’m starting to think that we’re supposed to get the naturalist out exploring to find more trees and possibly relocate the colony….. If you are still having save-crashing problems, please try pulling Revision 34A and letting me know. So far nobody has reported any with Revision 34A and I am Hopeful We’ve Finally Licked It. 34A: I have abandoned the game because the game was too jerky, the military doesn’t obey the flag, they fight only individually, otherwise it all looks ok, bye. 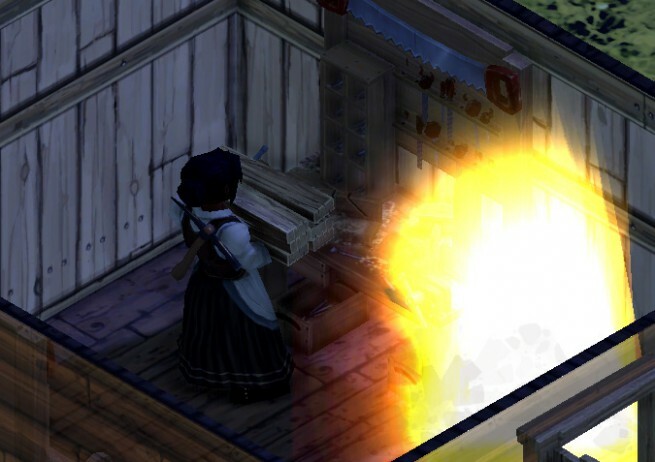 If exploding carpentry benches were to stay in the game, you know, under certain circumstances, I’d be up for that.